Draw a graph with four quadrants on a big whiteboard. 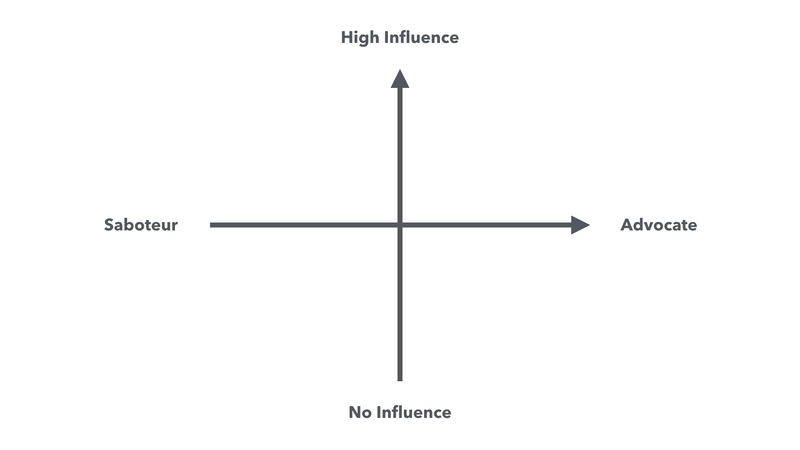 Write “high influence” at the top and “low influence” at the bottom. Write “saboteur” on the left and “advocate” on the right. Now, start adding the names of every person on your project. People with a high level of influence should stay toward the top of the chart, those without influence should be on the bottom. People who are actively trying to sabotage the project should be on the left, while those advocating for its success should be on the right. If your project is struggling, it’s likely that you have a few folks in the top left quadrant. You need to find a way to move them to the right. In other words, figure out their area of responsibility, and shape your project to help them in some way. Demonstrate that you can be valuable to them. To be super-proactive, just do this at the very beginning of every project (or as soon as you think you have an understanding of those involved). Then, reevaluate every so often. Chances are, it will shift throughout the work. Get the influential folks to be advocates, and the rest will fall into place. P.S. This may actually be more important than doing good work.